Ever wonder why some of your staff give everything they've got each day, while others do barely enough to get by in terms of individual performance? From a recent keynote presentation at the CCNG Optimize event in Phoenix, AZ, Penny Reynolds shares several tips and techniques for getting more out of your center's most valuable resource — your employees. 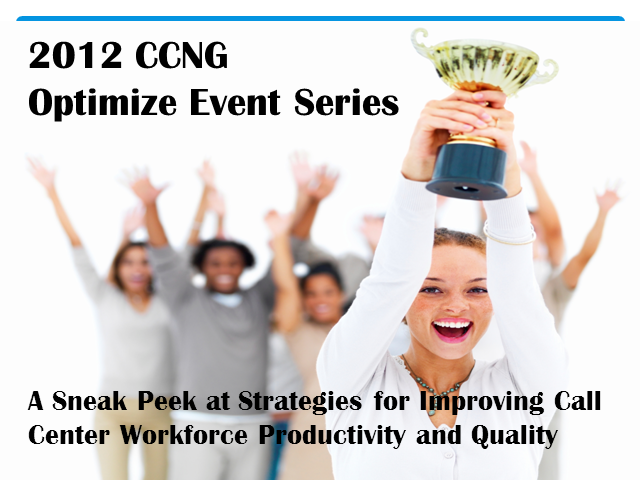 This is some of the content from her keynote address about workforce strategies, a very popular keynote at this year's CCNG Optimize events. Don't miss this fast-paced session and some great highlights and take-aways that can make your workforce more productive. Join Penny Reynolds, Co-Founder of The Call Center School as she talks with CCNG President and CEO David Hadobas on this enlightening and popular webcast (number one in a regular series of webcasts from CCNG and The Call Center School launching in May 2012).